I just saw this on the Late Night With Jimmy Fallon Website. Sweet, i totally want one!! Dude, that is soo awesome! They've done a ton of different celebs. omg, too funny! &, it kinda looks like your snow sculpture! I saw that on Gizmodo and immediately thought of you! So tempting to get one...but I'm not made of money. Ah, yes... just in time for the tax return! Awesome!!! And having Spock there on the screen totally makes it even awesomer. 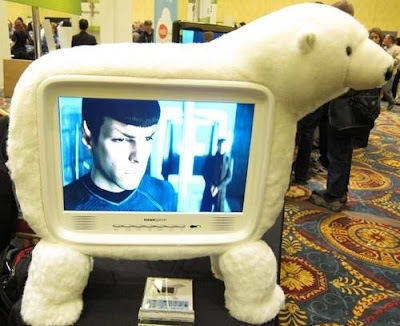 speaking of polar bears, did you ever see this? I think a life sized Hurley TV would be waaayyy mor awesome . . I 'll make you one if you want? Wicked awesome. So word on the street is that the date of the President's speech is being decided by how many constituants are going to be ticked off because of their show being preempted. It's between the premiere of LOST and American Idol. Yea for not having satellite and depending on Hulu. Jorge,is a great idea!!! Maybe they have seen, your erlier post with snow's polar bear!??? It's good and all, but I don't think it would go with my sofa... which is a hollowed out whale! My first thought was to fling my computer across the room! A complete desecration of the alpha predator of Canada! C'est la vie -I suppose a timber wolf foot rest is next! Do you mind if this link is posted so that these men might be found? Arrow Trucking left them stranded. If not, that is cool, Jorge. BETH BETH BETH BETH BETH! Oh mylanta, I saw you on LOST! It was you, wasn't it? Behind Sun on the beach, crowded around Frank during the "Namaste" episode! I mean, most of the photos of you on this blog aren't very close up, but based on the "rat" videos, I think that it was you! Hi Dude :-) How are you? I hope fine. And Beth? I hope she is fine too. Well, would you like to watch something about you as Hurley? Seriously, Beth, that is totally awesome. I made my hubby stop the DVD and replay it a couple of times. I got so excited for you - as if you were a personal friend. Are you in any other scenes? If so, I am going to have to go back to do the "BethWatch" starting in season 1! This confusing I mean... it must be a consequence of a weird Dharma experiment!